The 10 Best State Parks in West Virginia! As one of the states along the Appalachian Mountain range, West Virginia has no lack of great state parks. One visit to any of these great parks will show you why they call it Wild Wonderful West Virginia. There are dozens of hiking and biking trails, gorgeous landscapes that offer photo opportunities, historic buildings to tour, and overnight accommodations from lodges to primitive camping. Whether you’re looking for a great family camping trip, a day trip to hike one of the trails, or a romantic weekend getaway, you’ll find endless possibilities for fun. Here are the best state parks in West Virginia! Home to one of West Virginia’s canyons, Coopers Rock State Forest offers views that will take your breath away as you look out over the Cheat River below. Established in 1936, the Civilian Conservation Corp built many of the buildings that are now listed on the National Register of Historic Places. Most can be toured, including the first steam-powered blast furnace in the state used during the time when the iron industry was at its peak. Open year round, the park has 21 hiking and biking trails, three ski trails, and 25 camping sites that are open from Memorial Day through Labor Day on a first-come, first-served basis. Named for the colored water caused by hemlock and red spruce needles, Blackwater Falls State Park if located in Davis, West Virginia on the edge of the Allegheny Mountains. Established in 1937, the state added overnight lodging in the 1955s, and features a 54-room lodge, restaurant and conference center, RV area and campground open from April through October. There are 20 hiking trails in the park and plenty of outdoor adventures including biking, boating, fishing, geocaching, and swimming. After being one of the oldest parks in the state, Grandview State Park became part of the National Park Service in 1990. The original 52 acres were to be used as a day park and the roads, shelters, and picnic areas were built by the Civilian Conservation Corps in 1939. A 1,200-seat amphitheater, children’s play area, and additional upgrades were added in the early 1960s. Today, the park is known for having some of the best and most photographed areas of the New River Gorge and National River, trails abundant with the state flower, rhododendrons, and visitor centers where you can learn more about the history of the area. Once a thriving and busy lumber town, Cass, West Virginia, is home to Cass Scenic Railroad State Park. Visitors to this quaint town will find themselves transported back in time to the early 1900s when the West Virginia Pulp and Paper Company employed the loggers who timbered the trees from the mountaintops and brought them down on trains pulled by Shay engines, a specially designed locomotive that made travel up and down the mountain possible. Bought by the state in 1977, 20 of the small company houses were transformed into art and craft shops and overnight lodging complete with linens, TV, fully-equipped kitchens, and heat for the winter. While there, you can hear the story about life in the lumber town, and take a train ride up the mountain and enjoy lunch on one of the highest spots in the state. The oldest and second largest forest in the state, Seneca State Forest in Dunmore will provide the perfect backdrop for pictures and memories that will last a lifetime. Nearly 12,000 acres of peaceful hiking and biking trails, opportunities for rock climbing, fishing and swimming, and just relaxing are yours for the taking. A 65-foot fire tower built by the Civilian Conservation Corps in 1924 allows you to see a panoramic view of the surrounding forest and if you’re fortunate to be there at night, the stars have never looked closer. Primitive cabins are available for rent, but there are also a limited number of sites for tents or trailers. One of the most photographed parks in the state, Babcock State Park in Clifftop, West Virginia has breathtaking landscape and is beautiful any time of year. With over 4,100 acres to explore, 15 trails lined with rhododendrons, and streams that weave in and around the rocky creek beds, there’s so much to do for those who love being outdoors. Created in the 1930s by the Civilian Conservation Corps, visitors can enjoy hiking, fishing, boating and rock climbing. The Glade Creek Grist Mill, a replica of one of the mills that used to exist in the area, was added in 1976 and can be toured. 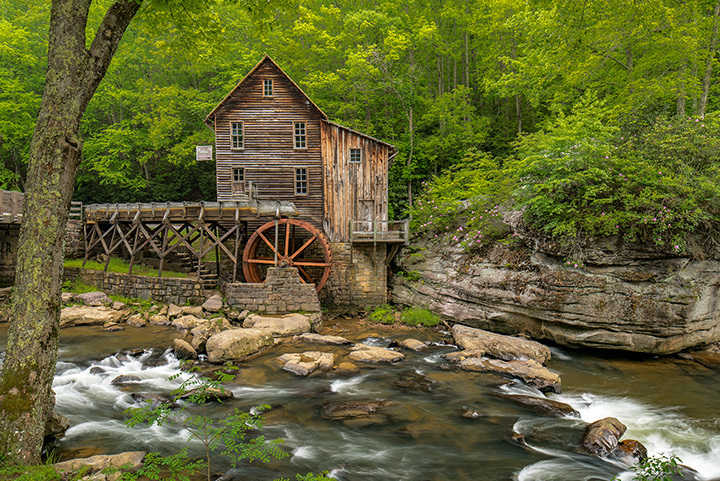 One of the unique features of the grist mill is that it’s a working mill and produces ground corn, which can be purchased in the gift shop. Cacapon means “medicine waters,” and Cacapon Resort State Park is renowned for the mineral waters that flow in the streams. With over 6,000 acres of year-round fun and adventure waiting for you in the eastern part of West Virginia, this state park was another park created by help from the Civilian Conservation Corps and opened in 1937. Overnight lodging was added a few years later, and a golf course in 1973 that have it resort status. Besides the 48-room lodge, there’s a 12-room log inn, a variety of cabins, and RV and tent camping. Seven trails are ready for you to explore, including several that are perfect for horseback riding. Situated on an island between Ohio and West Virginia in the Ohio River, Blennerhassett Island welcomes over 40,000 visitors each year via riverboat. Tours of the grand mansion are offered May through October, and there are many events including dinner cruises, live music, birding, and more. Once a favorite hunting ground for Native Americans, the early settlers of the island, Harman and Margaret Blennerhasset allowed their mansion to be used by Aaron Burr, who is known is history as a traitor. Overnight primitive camping is allowed by advance reservations, and there are walking tours and carriage rides around the grounds. Located in the southwestern part of the state in Ansted, Hawk’s Nest was used as a Native American trail and was also home to ospreys and a variety of hawks until the completion of the Chesapeake and Ohio Railway that drove the birds from the area. The state bought the land in 1935, and transformed it into a tourist location with a 31-room lodge, a restaurant, seven hiking trails, and offers events throughout the year that showcase the park. Now known as a popular destination for whitewater rafting along the New River, the park also has panoramic scenic views from below and at the top of the New River Gorge. Droop Mountain Battle State Park became a state park in 1929, and has a distinction that no other park in West Virginia has. It was the largest and last significant battle fought in the state during the Civil War. Located in Hillsboro in the beautiful Greenbrier River Valley, this state park is included on The Civil War Discovery Trail, and is one of over 300 locations in 16 states where visitors can learn about the impact of this internal war on the country. With a goal to bring history alive, Droop Mountain Battlefield State Park doesn’t allow overnight camping, but there are camping areas and cabins nearby. There are eight hiking trails, and two picnic shelters, and two play areas for the kids and a great wooden lookout tower that some believe is haunted. View more West Virginia Parks.